Tom Reynolds was forced to fill in in goal for Racing Club on Saturday. 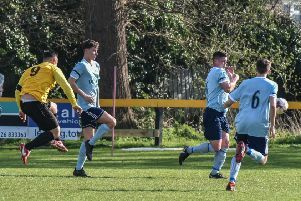 A single goal was enough to condemn Racing Club Warwick to a fourth successive Midland League Division One defeat at third-placed Littleton. In an evenly matched game the Racers again failed to take their chance to continue their worrying slide down the table. Striker Wade Malley started superbly and should have earned a penalty in the sixth minute when he was bundled over by the Littleton keeper, but the referee waved away appeals. A smart Jake Brown back-heel then allowed Tez Morton to fire in a cross which Brown volleyed just wide. With 20 minutes on the clock, Littleton opened the scoring when a mistake in the Racers defence allowed Jamie Clarke to outpace Cameron Knight and fire past stand-in keeper Tom Reynolds. Adam Laight almost equalised after a turn and shot but the ball was cleared off the line before Morton was also denied by a last-ditch intervention. Despite having plenty of possession after the break, Racing produced just one clear-cut chance with Chris Hayden cleverly slipping in Jake Brown whose shot was fingertipped around the post. Ten-man Racing Club were unable to gain their revenge on Tuesday night, slipping to a 5-1 home defeat against Littleton after having debutant keeper Joshua Banks sent off in the first half. Racing Club will be hoping to get their league campaign back on track tomorrow when they entertain rock-bottom Bolehall Swifts (3pm).